I'm a bit iffy about shrimp. The texture troubles me and I dislike cocktail sauce (the way shrimp is typically available to me); however, my husband likes shrimp. Thus my quest to find a shrimp recipe(s) that I enjoy. Aldi sells frozen bags of de-veined, peeled shrimp for under $4. I bought a bag of the medium-size and set out to find a recipe. The Cooking Light website offered several recipes that sounded quite good, but for the sake of ingredients on hand, I tried the Stir-Fried Shrimp with Spicy Orange Sauce. I added a bag of frozen sugar snap peas and diced onion (didn't have the green onions) and served it on a bed of vermicelli noodles. The flavor was delicious. The texture, I'll continue to acquire. Overall, a success and a recipe I'd definitely consider making again and tweaking with additional veggies. Bonus, this is easily made gluten-free, if you use gf soy sauce (La Choy brand is gf, also San-J wheat-free Tamari). Place shrimp in a medium bowl. Sprinkle with cornstarch; toss to coat. Set aside. Combine juice, soy sauce, honey, rice vinegar, and chile paste, stirring with a whisk. Set aside. Heat oil in a large nonstick skillet or a wok over medium-high heat. Add the minced ginger and garlic; stir-fry for 15 seconds, until fragrant. Add shrimp mixture and any additional veggies of choice; stir-fry for 3 minutes. Add juice mixture and onions; cook 2 minutes or until the sauce thickens and shrimp is done, stirring frequently. 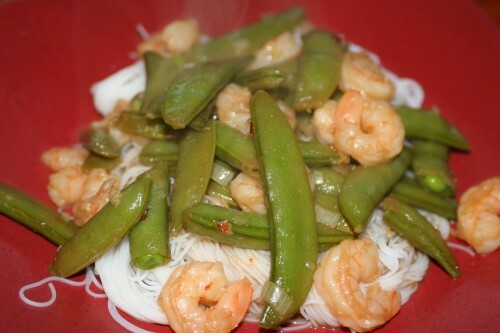 Serve immediately over a bed of rice, vermicelli noodles, or stir-fried veggies. Shrimp and broccoli florets, tossed in olive oil, lemon, and seasoned salt, then roasted is DELICIOUS! this sounds really good. i'm kind of with you on shrimp. it's ok, but not something i usually get excited about (unless it's coconut fried shrimp:). luke likes it though, so i may give this a try sometime. That sounds quite good, Kim. Thanks for the suggestion!